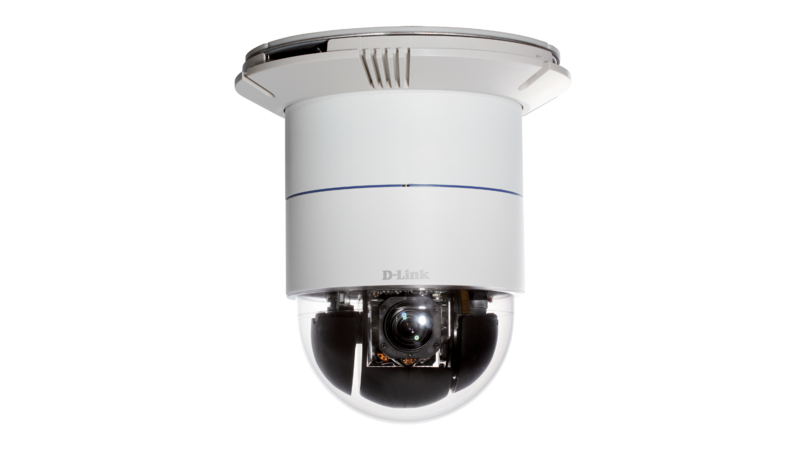 D-Link’s DCS-6616 12X WDR Day/Night Speed Dome Camera is a PTZ surveillance solution that can cover large areas and low-light environments. Built with a Sony Super HAD-II 1/4” CCD sensor, the DCS‑6616 can capture 650 TVL high-resolution video with excellent image quality. A built-in IR-cut removable filter allows the camera to capture video in both bright and dark environments. 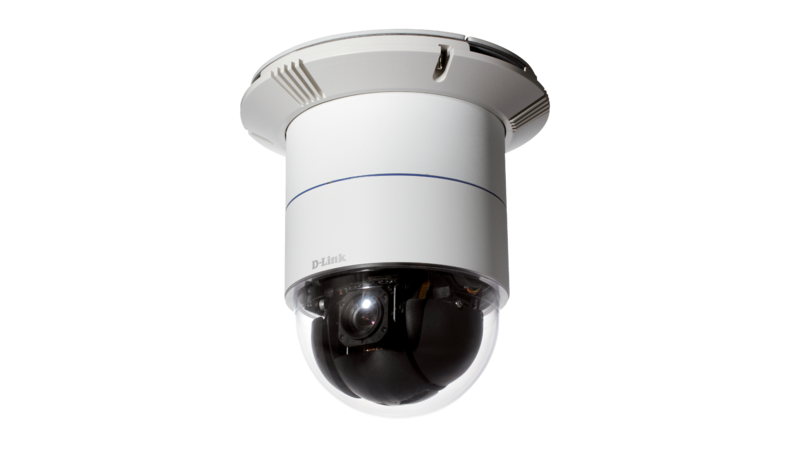 D-Link’s DCS-6616 12X WDR Day/Night Speed Dome Camera is a PTZ surveillance solution that can cover large areas and low-light environments. Built with a Sony Super HAD-II 1/4” CCD sensor, the DCS‑6616 can capture 650 TVL high-resolution video with excellent image quality. A built-in IR-cut removable filter allows the camera to capture video in both bright and dark environments. During the day, the IR-cut filter moves out of the way to provide high-quality images. At night, the IR-cut filter stays in, allowing the camera to use all available light for low-light surveillance. The DCS-6616 is built with an extensive set of PTZ features that allow large areas to be monitored easily. Endless 360° panning allows the camera to sweep an area easily, and 12X optical zoom with auto focus provides the ability to zoom in and focus on an event for more detail. Panning speed is variable and proportional to the zoom ratio for precise control over camera movement. The DCS-6616 can also be set to follow preset sequence paths at set speeds for customised automatic surveillance. The DCS-6616 includes input and output ports that allow connectivity to external devices such as IR sensors, switches, and alarm relays. It includes audio input and output ports, and a video output for direct connection to a TV for live monitoring. The Wide Dynamic Range (WDR) function provides clear images even under backlit conditions where the intensity of illumination can vary significantly, making the DCS-6616 perfect for extreme high-contrast environments. For example, when placed indoors, the DCS-6616 will adjust itself to the intense sunlight that may be streaming in through a nearby window. This makes it an ideal solution for security applications. The DCS-6616 supports simultaneous streaming of H.264, MPEG-4, and MJPEG video to provide both high-quality and bandwidth-efficient compression formats. MJPEG delivers excellent file integrity, and is ideal for situations which require high image detail. H.264 and MPEG-4 produce a small file size, useful for extended recording or for use in low-bandwidth networks. Additionally, the DCS-6616 supports multicast H.264 and MPEG-4 streaming, allowing users to view the camera feed by subscribing to a multicast IP address on the network. Support for 3GPP Mobile Surveillance allows users to view a live video feed from a 3GPP compatible Internet-ready mobile device. This extends monitoring capability, allowing users to check the camera’s video feed while on the go without a computer. The included D-Link D-ViewCam™ is sophisticated software which allows users to manage up to 32 network cameras, set e-mail alert notifications, create recording schedules, and use motion detection to record directly important events to a hard drive. D-ViewCam™ also allows users to upload a floor plan to create a realistic layout of the premises where cameras are located, further simplifying the management process. The Open Network Video Interface Forum (ONVIF) is standards relating to open IP video networking. The DCS-6616 is ONVIF compliant and therefore interoperable with other manufacturer’s products on the same network such as cameras, storage systems, video analytics products and Video Management Systems. For more information on ONVIF and compatible D-Link network cameras, please click here. This product was phased out on: 6.9.2016.